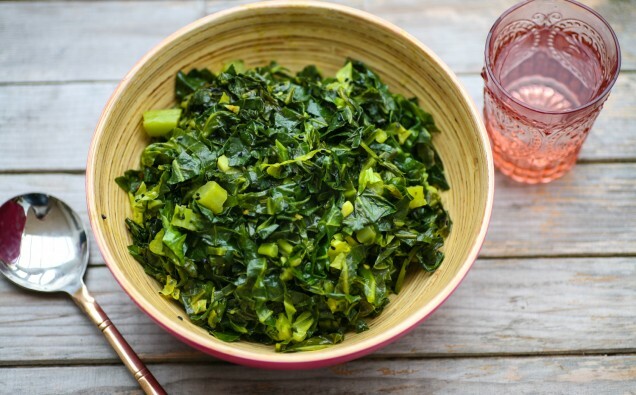 This recipe suits any greens you have to hand – from shredded kale to Brussels sprouts. For the less adventurous, less chilli can be used. Heat the oil in a large non-stick pan or wok, sizzle the cumin and mustard seeds for 1 min, then add the chilli, ginger and turmeric. Fry until aromatic, and then add the greens, a pinch of salt, a splash of water and the peas. Cover the pan and cook for 4-5 mins until the greens have wilted. Add the lemon juice, ground coriander, half the fresh coriander and half the desiccated coconut, then toss everything together. Pile into a serving dish and scatter with the rest of the coconut and coriander.